When it comes to explaining fundamental economic principles by drawing on current economic issues and events, there is no one more effective than Nobel laureate and New York Times columnist Paul Krugman and co-author, Robin Wells. 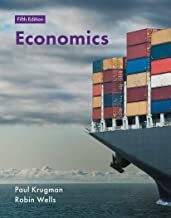 In this best-selling introductory textbook, Krugman and Wells' signature storytelling style and uncanny eye for revealing examples help readers understand how economic concepts play out in our world. Economics 5e provides unparalleled coverage of current topics, including sustainability, the economic impact of technology and pressing policy debates. A commitment to broadening students' understanding of the global economy; a global focus is woven throughout with more on the ascendance of China's economy, the Euro and events in Europe (including Brexit), and post-recession economies around the globe.